Please call owner Earl at 314-270-8247. Boat is in Affton, Missouri. Hey...Here is your last chance to get this bargain....this will make a Great Christmas or Fathers Day Gift for someone in the coming year.....2013 Tracker Gator 17' Aluminum like new with new carpet. 2 Bass seats, 2 marine batteries, 6 Gal. 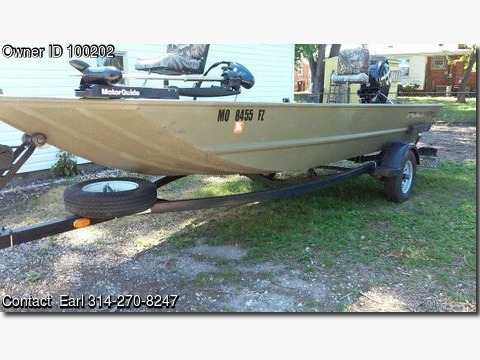 gas tank, 2 Oars, 4 safety vests, , motor guide trolling motor, with Gator 360 flex mount like new, Motor: 2012 25HP Mercury 4 stroke like new, less than 20 hours with brand new boat motor cover. Trailer: 2002 Yach, rebuilt heavy duty. Extension for trailer hitch included.